The last member of the Samsung Galaxy S II trio of droids is here, people. The T-Mobile version of the smartphone was the last to get its availability announced. It will be available online on October 10, and in T-Mobile stores on October 12. The T-Mobile Galaxy S II does sport quite a few changes, compared to its GSM siblings, starting with its bigger 4.52 Super AMOLED Plus screen and a different CPU under its cover. Its battery is beefier as well. Now on with our initial impressions. The Galaxy S II for T-Mobile is not powered by the highly revered Exynos CPU like its AT&T and Sprint Wireless siblings. Instead, the droid packs a Qualcomm Snapdragon S3 chipset with two 1.5GHz Scorpion cores and Adreno 220 graphics. 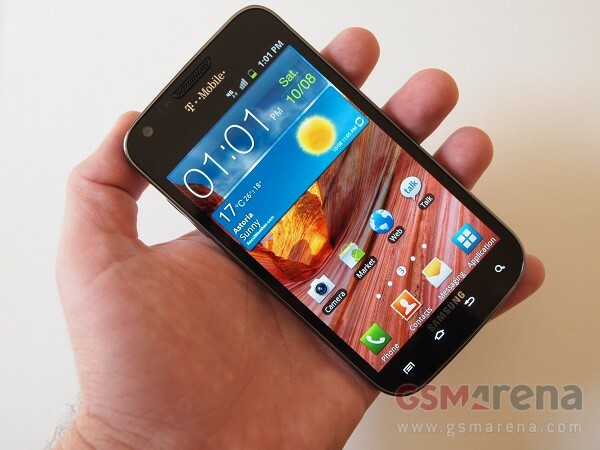 The new chipset enables the Galaxy S II for T-Mobile to reach network speeds of up to 42Mbps. The 4.52″ Super AMOLED screen is as gorgeous as always. Its resolution is WVGA like in the rest of the Galaxy S II lineup. A gig of RAM is at your disposal, along with 16GB of built-in memory. In case it doesn’t cut it for you, there is a microSD card slot too. The already familiar 8MP camera will assist you with capturing your memories, along with a 2MP front unit for video calls. The Galaxy S II for T-Mobile also sports NFC capability which is fully functional. The Galaxy S II comes with Android 2.3.5 Gingerbread out of the box. As always, the UI is Samsung’s own TouchWiz. We have a video of the droid in action for you. Check it out below. The different CPU in the T-Mobile Galaxy S II promises different performance than what we are used to. You will find out more about it in our full review which is already in the works. Stay tuned!